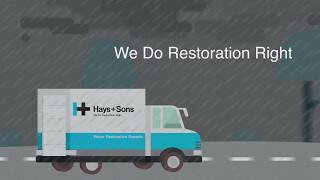 If you’ve got water damage, call the experts at Hays + Sons. Our water restoration experts have seen it all and are eager to help you get your home back to normal. In this video, we’ll walk you through our step-by-step restoration process. With over 35 years of experience, you can trust Hays + Sons to get the job done.